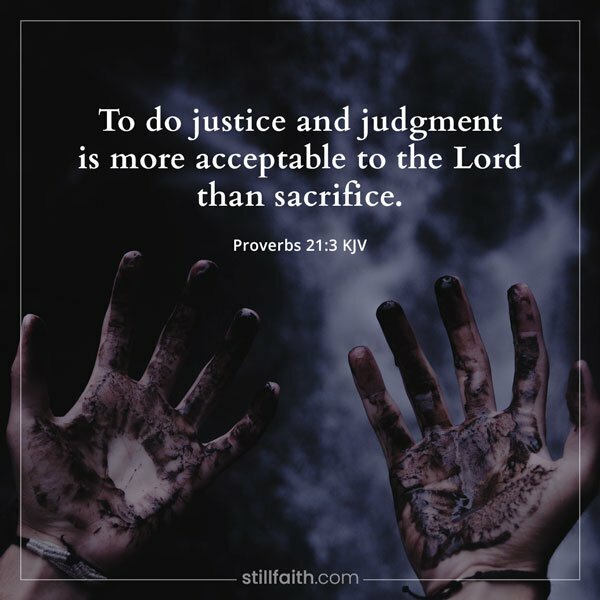 Here are 122 Bible verses about justice from the Old and New Testament of The Holy Bible, King James Version (KJV), New International Version (NIV), and New Living Translation (NLT). Download a personal copy of this important Bible verses about justice! So now, come back to your God. Act with love and justice, and always depend on him. Justice is a joy to the godly, but it terrifies evildoers. He that saith unto the wicked, Thou are righteous; him shall the people curse, nations shall abhor him: But to them that rebuke him shall be delight, and a good blessing shall come upon them. Whoever says to the guilty, “You are innocent,” will be cursed by peoples and denounced by nations. But it will go well with those who convict the guilty, and rich blessing will come on them. A judge who says to the wicked, “You are innocent,” will be cursed by many people and denounced by the nations. But it will go well for those who convict the guilty; rich blessings will be showered on them. Depart from evil, and do good; and dwell for evermore. 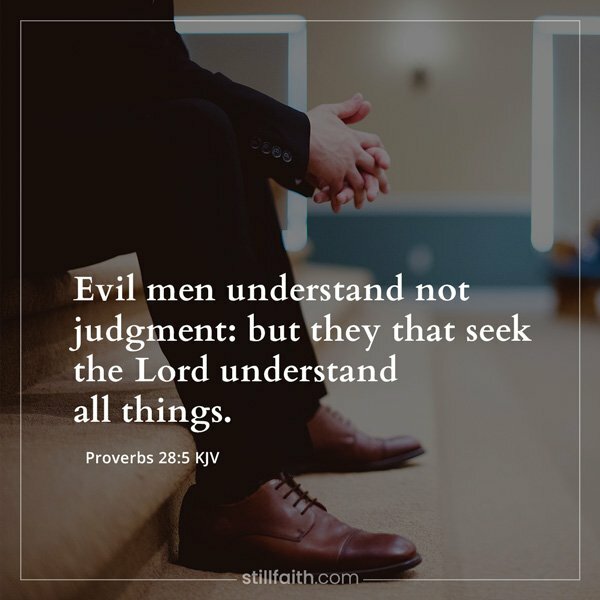 For the Lord loveth judgment, and forsaketh not his saints; they are preserved for ever: but the seed of the wicked shall be cut off. The righteous shall inherit the land, and dwell therein for ever. Turn from evil and do good; then you will dwell in the land forever. For the Lord loves the just and will not forsake his faithful ones. Wrongdoers will be completely destroyed; the offspring of the wicked will perish. The righteous will inherit the land and dwell in it forever. And therefore will the Lord wait, that he may be gracious unto you, and therefore will he be exalted, that he may have mercy upon you: for the Lord is a God of judgment: blessed are all they that wait for him. For the people shall dwell in Zion at Jerusalem: thou shalt weep no more: he will be very gracious unto thee at the voice of thy cry; when he shall hear it, he will answer thee. So the Lord must wait for you to come to him so he can show you his love and compassion. For the Lord is a faithful God. Blessed are those who wait for his help. O people of Zion, who live in Jerusalem, you will weep no more. He will be gracious if you ask for help. He will surely respond to the sound of your cries. Blessed are those who act justly, who always do what is right. There is joy for those who deal justly with others and always do what is right. “This is what the Lord of Heaven’s Armies says: Judge fairly, and show mercy and kindness to one another. 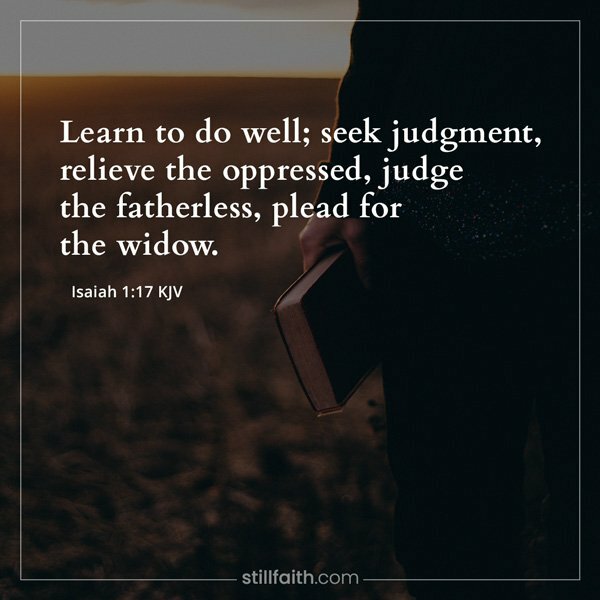 Do not oppress widows, orphans, foreigners, and the poor. And do not scheme against each other. 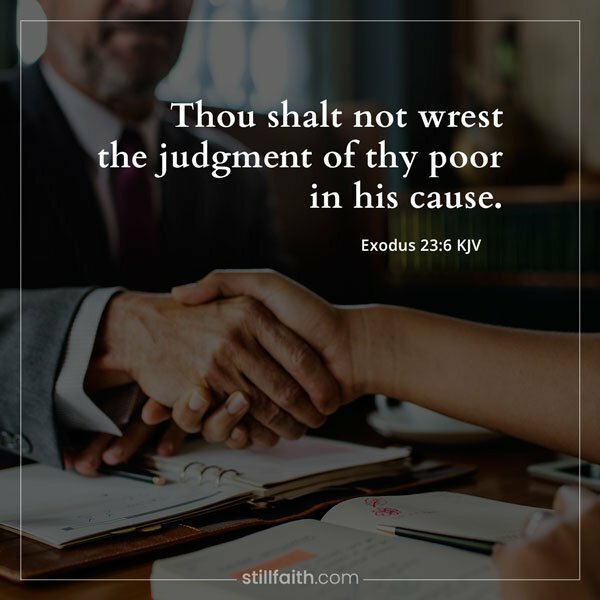 “‘Do not pervert justice; do not show partiality to the poor or favoritism to the great, but judge your neighbor fairly. “Do not twist justice in legal matters by favoring the poor or being partial to the rich and powerful. Always judge people fairly. Hearken unto me, my people; and give ear unto me, O my nation: for a law shall proceed from me, and I will make my judgment to rest for a light of the people. My righteousness is near; my salvation is gone forth, and mine arms shall judge the people; the isles shall wait upon me, and on mine arm shall they trust. “Listen to me, my people; hear me, my nation: Instruction will go out from me; my justice will become a light to the nations. My righteousness draws near speedily, my salvation is on the way, and my arm will bring justice to the nations. The islands will look to me and wait in hope for my arm. “Listen to me, my people. Hear me, Israel, for my law will be proclaimed, and my justice will become a light to the nations. My mercy and justice are coming soon. My salvation is on the way. My strong arm will bring justice to the nations. All distant lands will look to me and wait in hope for my powerful arm. This is what the Lord says: “Don’t let the wise boast in their wisdom, or the powerful boast in their power, or the rich boast in their riches. But those who wish to boast should boast in this alone: that they truly know me and understand that I am the Lord who demonstrates unfailing love and who brings justice and righteousness to the earth, and that I delight in these things. I, the Lord, have spoken! 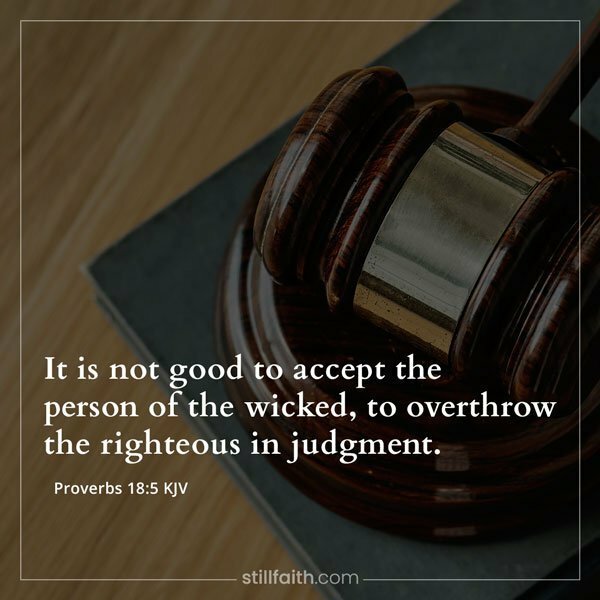 This is what the LORD says: “Maintain justice and do what is right, for my salvation is close at hand and my righteousness will soon be revealed. This is what the LORD says: “Be just and fair to all. Do what is right and good, for I am coming soon to rescue you and to display my righteousness among you. This is what the LORD says: Be fair-minded and just. Do what is right! 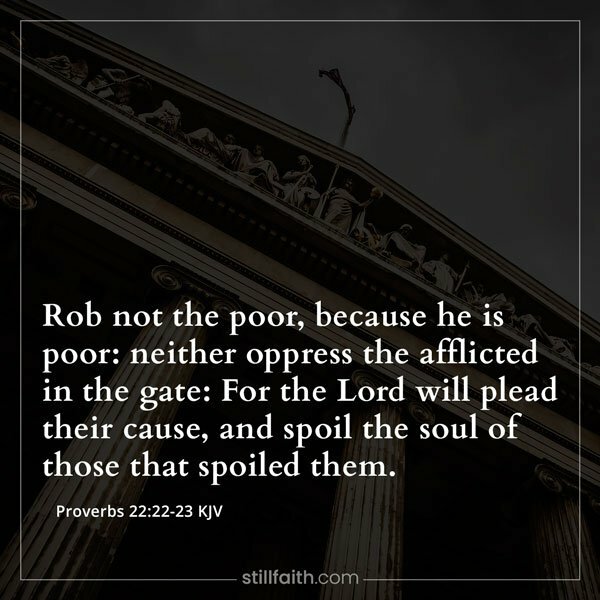 Help those who have been robbed; rescue them from their oppressors. Quit your evil deeds! Do not mistreat foreigners, orphans, and widows. Stop murdering the innocent! He ensures that orphans and widows receive justice. He shows love to the foreigners living among you and gives them food and clothing. Of David. A psalm. I will sing of your love and justice; to you, LORD, I will sing praise. A psalm of David. I will sing of your love and justice, LORD. I will praise you with songs. “Give justice to the poor and the orphan; uphold the rights of the oppressed and the destitute. 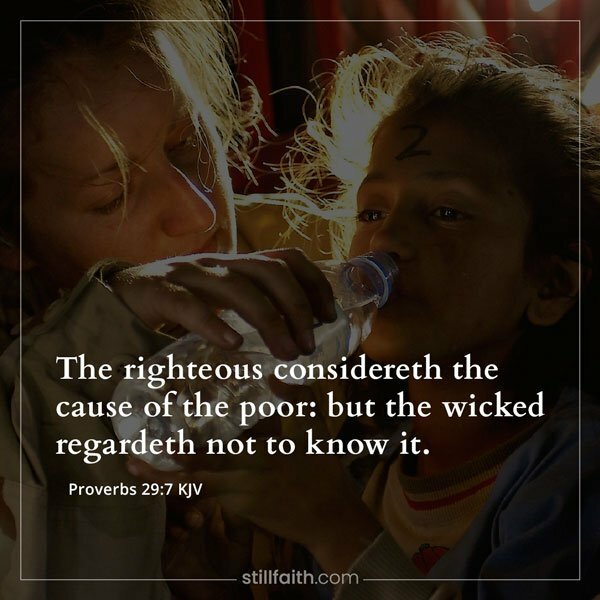 Rescue the poor and helpless; deliver them from the grasp of evil people. Does God twist justice? Does the Almighty twist what is right? 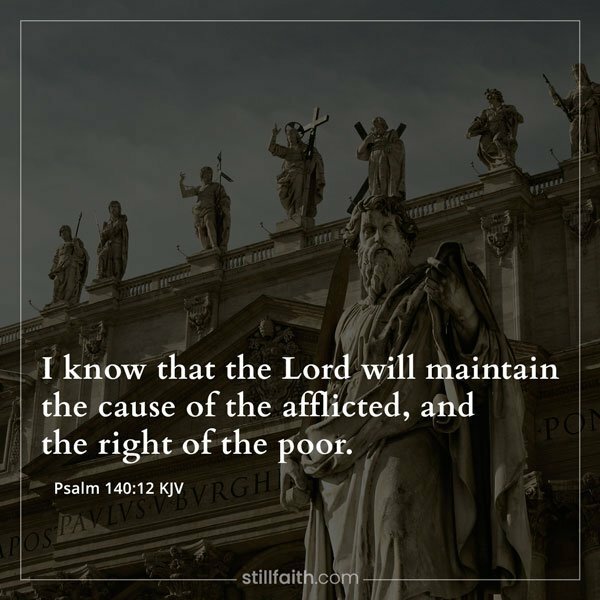 But I know the LORD will help those they persecute; he will give justice to the poor. Because I will publish the name of the Lord: ascribe ye greatness unto our God. He is the Rock, his work is perfect: for all his ways are judgment: a God of truth and without iniquity, just and right is he. Thou hast a mighty arm: strong is thy hand, and high is thy right hand. 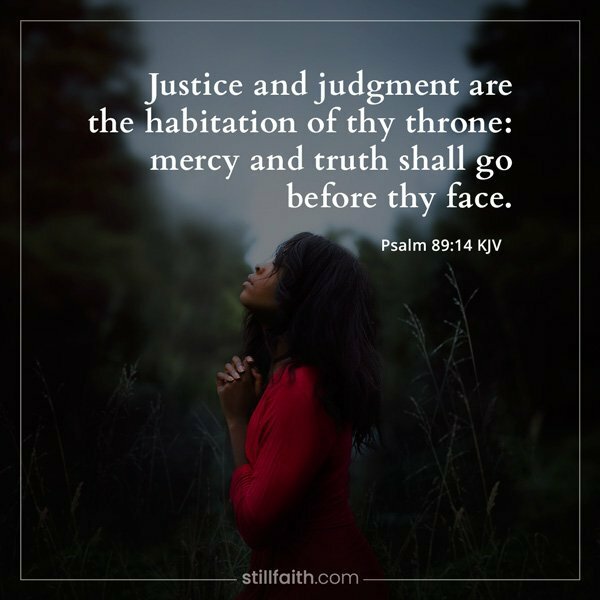 Justice and judgment are the habitation of thy throne: mercy and truth shall go before thy face. Your arm is endowed with power; your hand is strong, your right hand exalted. Righteousness and justice are the foundation of your throne; love and faithfulness go before you. Powerful is your arm! Strong is your hand! Your right hand is lifted high in glorious strength. Righteousness and justice are the foundation of your throne. Unfailing love and truth walk before you as attendants. Declare what is to be, present it– let them take counsel together. Who foretold this long ago, who declared it from the distant past? Was it not I, the LORD? And there is no God apart from me, a righteous God and a Savior; there is none but me. Consult together, argue your case. Get together and decide what to say. Who made these things known so long ago? What idol ever told you they would happen? Was it not I, the LORD? For there is no other God but me, a righteous God and Savior. There is none but me. Do what is good and run from evil so that you may live! Then the Lord God of Heaven’s Armies will be your helper, just as you have claimed. Hate evil and love what is good; turn your courts into true halls of justice. Perhaps even yet the Lord God of Heaven’s Armies will have mercy on the remnant of his people. Arise, LORD, in your anger; rise up against the rage of my enemies. Awake, my God; decree justice. Arise, O LORD, in anger! Stand up against the fury of my enemies! Wake up, my God, and bring justice! They take bribes to let the wicked go free, and they punish the innocent. “For the time is coming,” says the LORD, “when I will raise up a righteous descendant from King David’s line. He will be a King who rules with wisdom. He will do what is just and right throughout the land. It is not good to be partial to the wicked and so deprive the innocent of justice. It is not right to acquit the guilty or deny justice to the innocent. 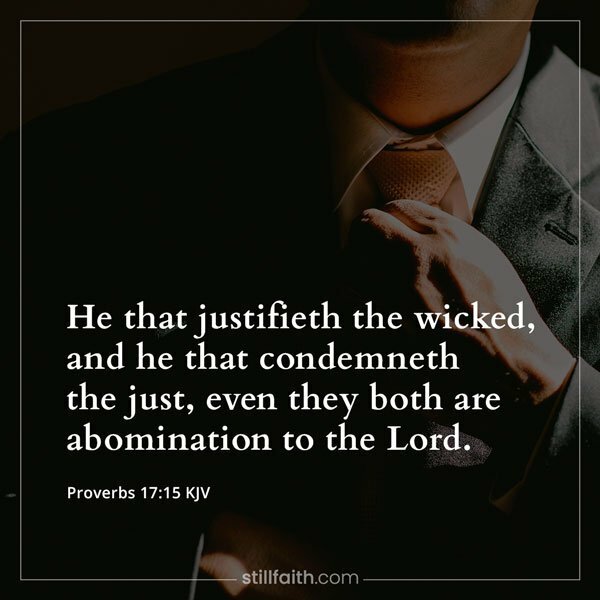 Ye who turn judgment to wormwood, and leave off righteousness in the earth. The righteous cry, and the Lord heareth, and delivereth them out of all their troubles. The Lord is nigh unto them that are of a broken heart; and saveth such as be of a contrite spirit. Shall horses run upon the rock? will one plow there with oxen? for ye have turned judgment into gall, and the fruit of righteousness into hemlock. Thou shalt not pervert the judgment of the stranger, nor of the fatherless; nor take a widow’s raiment to pledge. The word of the Lord came again unto me, saying, Son of man, set thy face against the Ammonites, and prophesy against them; And say unto the Ammonites, Hear the word of the Lord God; Thus saith the Lord God; Because thou saidst, Aha, against my sanctuary, when it was profaned; and against the land of Israel, when it was desolate; and against the house of Judah, when they went into captivity; Behold, therefore I will deliver thee to the men of the east for a possession, and they shall set their palaces in thee, and make their dwellings in thee: they shall eat thy fruit, and they shall drink thy milk. And I will make Rabbah a stable for camels, and the Ammonites a couching place for flocks: and ye shall know that I am the Lord. For thus saith the Lord God; Because thou hast clapped thine hands, and stamped with the feet, and rejoiced in heart with all thy despite against the land of Israel; Behold, therefore I will stretch out mine hand upon thee, and will deliver thee for a spoil to the heathen; and I will cut thee off from the people, and I will cause thee to perish out of the countries: I will destroy thee; and thou shalt know that I am the Lord. Thus saith the Lord God; Because that Moab and Seir do say, Behold, the house of Judah is like unto all the heathen; Therefore, behold, I will open the side of Moab from the cities, from his cities which are on his frontiers, the glory of the country, Bethjeshimoth, Baalmeon, and Kiriathaim, Unto the men of the east with the Ammonites, and will give them in possession, that the Ammonites may not be remembered among the nations. And I will execute judgments upon Moab; and they shall know that I am the Lord. Thus saith the Lord God; Because that Edom hath dealt against the house of Judah by taking vengeance, and hath greatly offended, and revenged himself upon them; Therefore thus saith the Lord God; I will also stretch out mine hand upon Edom, and will cut off man and beast from it; and I will make it desolate from Teman; and they of Dedan shall fall by the sword. And I will lay my vengeance upon Edom by the hand of my people Israel: and they shall do in Edom according to mine anger and according to my fury; and they shall know my vengeance, saith the Lord God. Thus saith the Lord God; Because the Philistines have dealt by revenge, and have taken vengeance with a despiteful heart, to destroy it for the old hatred; Therefore thus saith the Lord God; Behold, I will stretch out mine hand upon the Philistines, and I will cut off the Cherethims, and destroy the remnant of the sea coast. And I will execute great vengeance upon them with furious rebukes; and they shall know that I am the Lord, when I shall lay my vengeance upon them. The Spirit of the Lord God is upon me; because the Lord hath anointed me to preach good tidings unto the meek; he hath sent me to bind up the brokenhearted, to proclaim liberty to the captives, and the opening of the prison to them that are bound; To proclaim the acceptable year of the Lord, and the day of vengeance of our God; to comfort all that mourn; To appoint unto them that mourn in Zion, to give unto them beauty for ashes, the oil of joy for mourning, the garment of praise for the spirit of heaviness; that they might be called trees of righteousness, the planting of the Lord, that he might be glorified. And they shall build the old wastes, they shall raise up the former desolations, and they shall repair the waste cities, the desolations of many generations. And strangers shall stand and feed your flocks, and the sons of the alien shall be your plowmen and your vinedressers. But ye shall be named the Priests of the Lord: men shall call you the Ministers of our God: ye shall eat the riches of the Gentiles, and in their glory shall ye boast yourselves. For your shame ye shall have double; and for confusion they shall rejoice in their portion: therefore in their land they shall possess the double: everlasting joy shall be unto them. For I the Lord love judgment, I hate robbery for burnt offering; and I will direct their work in truth, and I will make an everlasting covenant with them. And their seed shall be known among the Gentiles, and their offspring among the people: all that see them shall acknowledge them, that they are the seed which the Lord hath blessed. I will greatly rejoice in the Lord, my soul shall be joyful in my God; for he hath clothed me with the garments of salvation, he hath covered me with the robe of righteousness, as a bridegroom decketh himself with ornaments, and as a bride adorneth herself with her jewels. For as the earth bringeth forth her bud, and as the garden causeth the things that are sown in it to spring forth; so the Lord God will cause righteousness and praise to spring forth before all the nations. Is not this the fast that I have chosen? 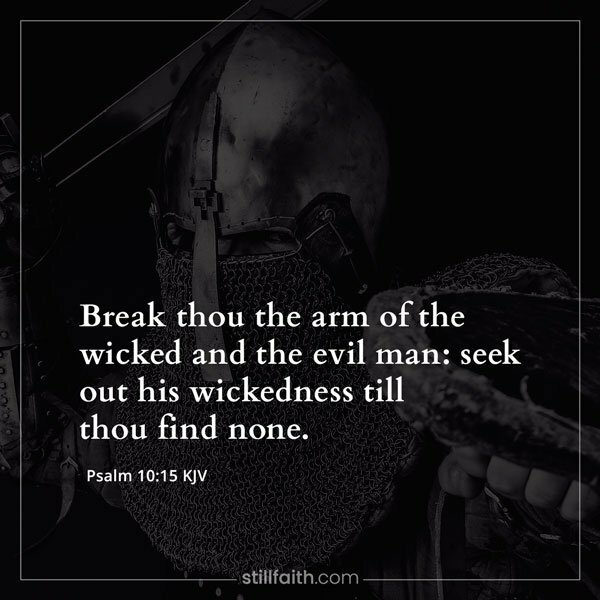 to loose the bands of wickedness, to undo the heavy burdens, and to let the oppressed go free, and that ye break every yoke? Is it not to deal thy bread to the hungry, and that thou bring the poor that are cast out to thy house? when thou seest the naked, that thou cover him; and that thou hide not thyself from thine own flesh? Then shall thy light break forth as the morning, and thine health shall spring forth speedily: and thy righteousness shall go before thee; the glory of the Lord shall be thy reward. Then shalt thou call, and the Lord shall answer; thou shalt cry, and he shall say, Here I am. If thou take away from the midst of thee the yoke, the putting forth of the finger, and speaking vanity; And if thou draw out thy soul to the hungry, and satisfy the afflicted soul; then shall thy light rise in obscurity, and thy darkness be as the noon day. Thy mercy, O Lord, is in the heavens; and thy faithfulness reacheth unto the clouds. Thy righteousness is like the great mountains; thy judgments are a great deep: O Lord, thou preservest man and beast. Happy is he that hath the God of Jacob for his help, whose hope is in the Lord his God: Which made heaven, and earth, the sea, and all that therein is: which keepeth truth for ever: Which executeth judgment for the oppressed: which giveth food to the hungry. The Lord looseth the prisoners: The Lord openeth the eyes of the blind: the Lord raiseth them that are bowed down: the Lord loveth the righteous: The Lord preserveth the strangers; he relieveth the fatherless and widow: but the way of the wicked he turneth upside down. 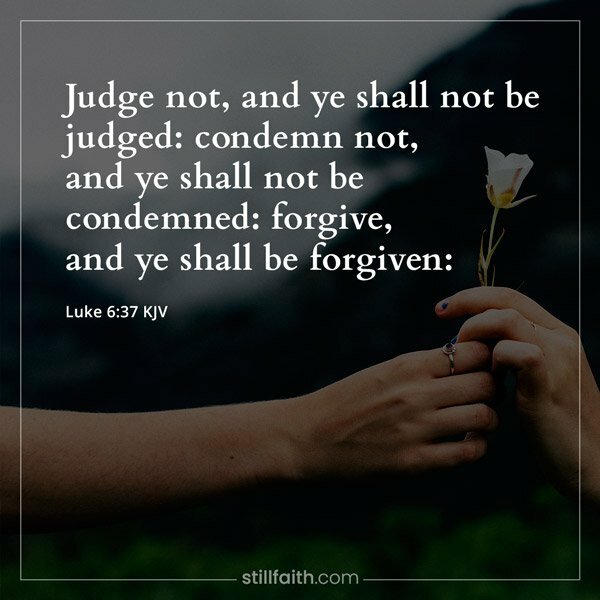 Judges and officers shalt thou make thee in all thy gates, which the Lord thy God giveth thee, throughout thy tribes: and they shall judge the people with just judgment. 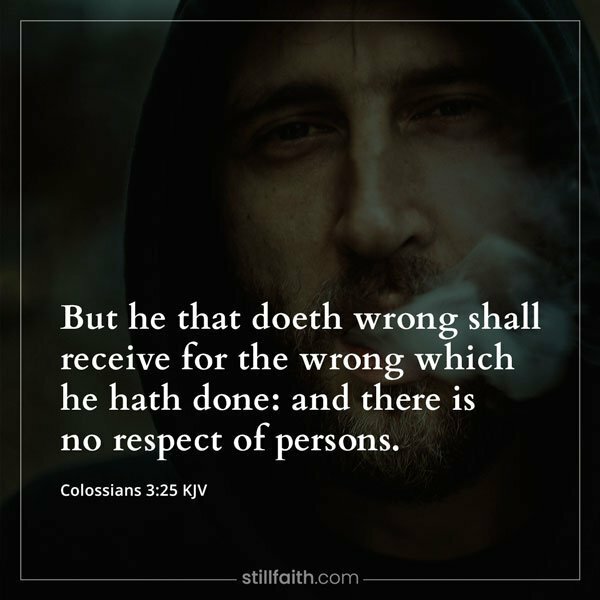 Thou shalt not wrest judgment; thou shalt not respect persons, neither take a gift: for a gift doth blind the eyes of the wise, and pervert the words of the righteous. That which is altogether just shalt thou follow, that thou mayest live, and inherit the land which the Lord thy God giveth thee. For if ye throughly amend your ways and your doings; if ye throughly execute judgment between a man and his neighbour; If ye oppress not the stranger, the fatherless, and the widow, and shed not innocent blood in this place, neither walk after other gods to your hurt: Then will I cause you to dwell in this place, in the land that I gave to your fathers, for ever and ever. Let every soul be subject unto the higher powers. For there is no power but of God: the powers that be are ordained of God. Whosoever therefore resisteth the power, resisteth the ordinance of God: and they that resist shall receive to themselves damnation. For rulers are not a terror to good works, but to the evil. Wilt thou then not be afraid of the power? do that which is good, and thou shalt have praise of the same: For he is the minister of God to thee for good. But if thou do that which is evil, be afraid; for he beareth not the sword in vain: for he is the minister of God, a revenger to execute wrath upon him that doeth evil. Wherefore ye must needs be subject, not only for wrath, but also for conscience sake. For for this cause pay ye tribute also: for they are God’s ministers, attending continually upon this very thing. Render therefore to all their dues: tribute to whom tribute is due; custom to whom custom; fear to whom fear; honour to whom honour. Owe no man any thing, but to love one another: for he that loveth another hath fulfilled the law. For this, Thou shalt not commit adultery, Thou shalt not kill, Thou shalt not steal, Thou shalt not bear false witness, Thou shalt not covet; and if there be any other commandment, it is briefly comprehended in this saying, namely, Thou shalt love thy neighbour as thyself. Love worketh no ill to his neighbour: therefore love is the fulfilling of the law. And that, knowing the time, that now it is high time to awake out of sleep: for now is our salvation nearer than when we believed. The night is far spent, the day is at hand: let us therefore cast off the works of darkness, and let us put on the armour of light. Let us walk honestly, as in the day; not in rioting and drunkenness, not in chambering and wantonness, not in strife and envying. But put ye on the Lord Jesus Christ, and make not provision for the flesh, to fulfil the lusts thereof. And Jesus answering said, A certain man went down from Jerusalem to Jericho, and fell among thieves, which stripped him of his raiment, and wounded him, and departed, leaving him half dead. And by chance there came down a certain priest that way: and when he saw him, he passed by on the other side. And likewise a Levite, when he was at the place, came and looked on him, and passed by on the other side. But a certain Samaritan, as he journeyed, came where he was: and when he saw him, he had compassion on him, And went to him, and bound up his wounds, pouring in oil and wine, and set him on his own beast, and brought him to an inn, and took care of him. And on the morrow when he departed, he took out two pence, and gave them to the host, and said unto him, Take care of him; and whatsoever thou spendest more, when I come again, I will repay thee. Which now of these three, thinkest thou, was neighbour unto him that fell among the thieves? And he said, He that shewed mercy on him. Then said Jesus unto him, Go, and do thou likewise. 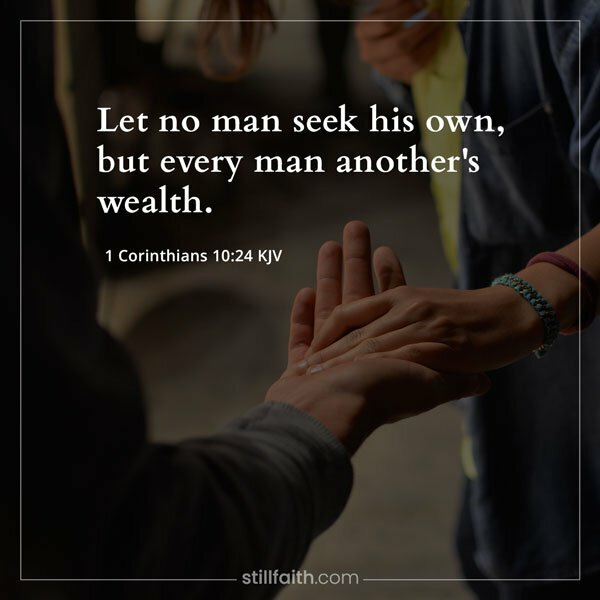 If a brother or sister be naked, and destitute of daily food, And one of you say unto them, Depart in peace, be ye warmed and filled; notwithstanding ye give them not those things which are needful to the body; what doth it profit? Seeing it is a righteous thing with God to recompense tribulation to them that trouble you; And to you who are troubled rest with us, when the Lord Jesus shall be revealed from heaven with his mighty angels, in flaming fire taking vengeance on them that know not God, and that obey not the gospel of our Lord Jesus Christ. Save this collection of important Bible verses about justice for later use. 📌 Pin this image to your Pinterest board.